As a family caregiver you know how important it is for your aging loved one to stay physically active. 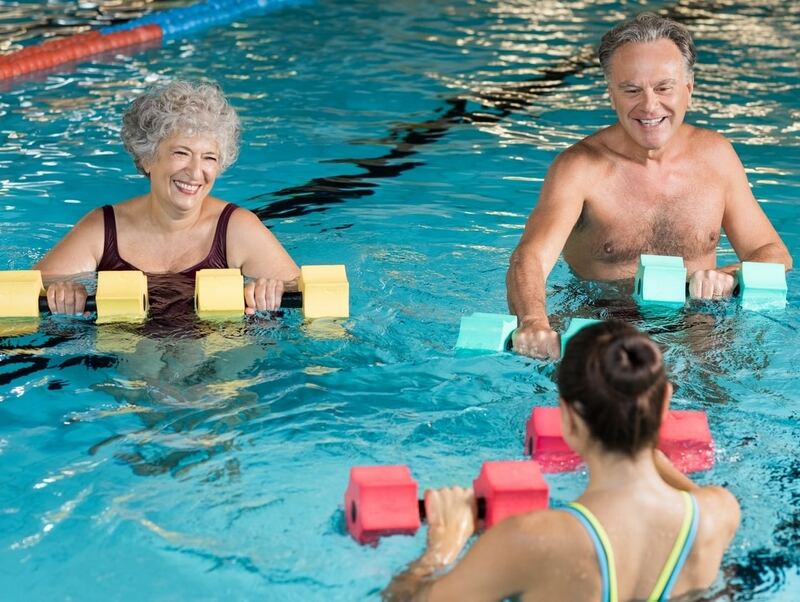 Getting enough exercise is a critical part of your parent maintaining physical, mental, and emotional health and well-being throughout their later years, and can help them to reduce the effects of the health complications they do have. It is important to customize their exercise to the health problems they have in order to give them the most benefit while also protecting them from potential consequences and complications associated with that disease. One example is osteoporosis. Elderly adults with this condition are at higher risk of suffering fractures and other issues, making keeping their body healthy and strong vital. Water supports the body, increases range of motion and flexibility, and reduces impact that can be dangerous to weakened bones. These exercises burn calories, strengthen muscles and joints, and improve cardiovascular health comfortably and safely. Just as with muscles, the tissue of bones needs exercise to stay strong, resilient, and healthy. Using their own body weight is a great way to strengthen their bones without having to use equipment. Walking and jogging are examples of weight bearing exercises that use your parent’s own body weight to strengthen and protect their bones. Your parent can also use equipment to help them exercise their body and strengthen their bones. Free weights and dumbbells are good choices but may be too heavy or difficult to manage for older adults. Try using resistance bands. These resemble large rubber bands and allow your parent to pull and stretch them to get the benefits of weight bearing with minimized risk. If your aging parent is at increased risk for osteoporosis or they have been diagnosed with this condition, starting home care for them can be a fantastic way to encourage them to continue living an active, engaged, and fulfilling quality of life while managing their condition. A home care provider can work with you to create a highly personalized approach to their care, support, encouragement, and assistance that helps them to not only deal with their condition, but keep their body healthy and safe, and keep pursuing the independent and enjoyable lifestyle they desire and deserve. This can include helping them to understand the risks they face as well as the instructions that were given to them by their doctor, and then offering reminders to help them stay compliant and make the best lifestyle choices for their needs. When it comes to helping them stay healthy through exercise, a home care provider can find activities they will enjoy and integrate them into their regular care routine. Especially if you are a distance caregiver or your schedule is busy and you are not able to be with your parent as frequently as you want to, this can give you peace of mind knowing they are getting the care they need, are staying active, and are remaining safe.